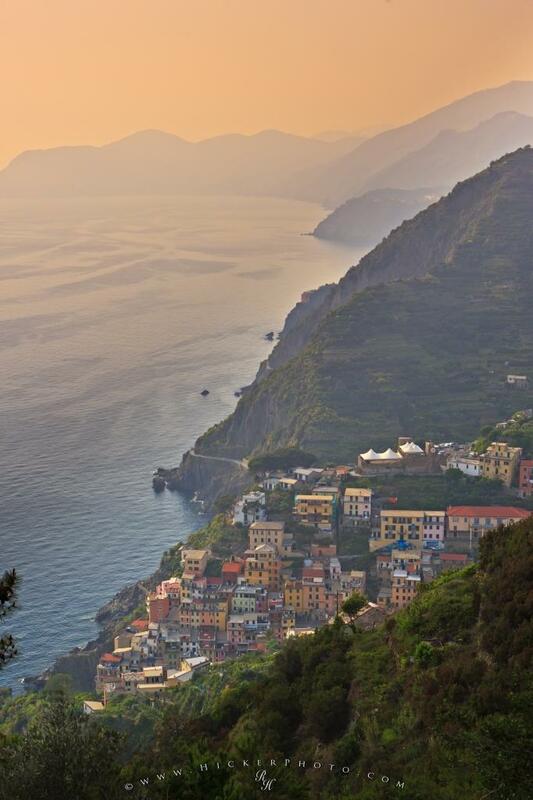 The tiny village of Riomaggiore perched on the side of a cliff in the National Park Cinque Terre in Liguria, Italy. The tiny village of Riomaggiore is perched on the steep side of a cliff in the Cinque Terre National Park in Liguria, Italy. If travelling from the south, Riomaggiore is the first of the five little villages, then comes Manarola, Corniglia, Vernazza and finally Monterosso. As well as relying on fishing, these Cinque Terre havens have vineyards and olive groves nestling here and there on the steep cliffs overlooking the Mediterranean Sea.Until recently Riomaggiore in Liguria, Italy was an old-fashioned tiny fishing village, but today, new apartments and houses are mixed with the old cottages and seems to gel nicely. Cinque Terre in Liguria, Italy in Europe. ... Either walking from village to village or boarding the train, you will enjoy very scenic views of the region. Village of Riomaggiore in the National Park Cinque Terre, Riviera di Levante, Liguria, Ligure, Italy, Europe. I photographed this photo with the digital SLR camera model Canon EOS-1Ds Mark II, aperture of f/6.3, exposure time of 1/320 sec. on ISO 200, as always I used a original Canon Lens, the focus lenght for this picture was 51mm.